Last weekend, in an NFTRH 396 excerpt we talked about Applied Materials stellar quarterly report and what it might mean for the economy, the Fed, the gold sector and most of all the idea of an inflationary backdrop becoming more readily apparent (2003-2007 Greenspan style). The Book-to-Bill (released May 24) took a big jump this week (data for April) and the Canary in a Coal Mine’s Canary (Semi Equipment is an earlier cyclical signpost than the broad Semi sector, which itself is often an early cycle leader) is chirping in similar fashion to late 2012/early 2013 when Semiconductor market leadership began. 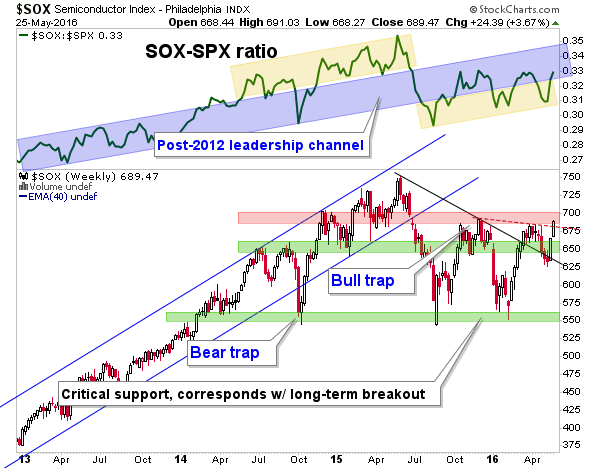 As for the Semiconductor index, its leadership has wobbled through the market disturbances of the last year. While still at resistance both in ratio to the S&P 500 and nominally, the last week has obviously been very constructive. In the quote above we note that a Semi cycle and its implications would pretty much kill the counter cyclical atmosphere that launched the gold sector (as did the 2001-2002 cycle) and likely signal a phase of inflationary economic growth. Now, no single indicator can be used to forecast an economy or the markets, but a strengthening Semi sector would be consistent with a growth phase. Again, ref. Greenspan era circa 2003-2007. In answer to the subscriber’s question about where to invest for inflation I would not profess to be the answer man on a subject with as many variables as global Central Banks, panicked and spraying market-friendly policy 24/7 through monetary fire hoses for years on end. Again, ‘inflationary effects’ is its own animal and capital will fly to various destinations at varying times. The disgusting NIRP policy cooked up in Japan and Europe has the potential to scare people so badly that distortions will likely build in certain asset markets. A final note before reviewing the US market as an inflationary investment destination (we will talk about other, more tradition ‘inflation trades’ like precious metals, commodities and emerging markets this weekend in NFTRH 397). Think the US is relatively sound today in its policy stance? Well sure, they have boosted the Fed Funds rate by .25%! What’s more, they likely have another one or two 1/4 points to come in 2016. But please consider the years of QE’s 1-3 and the 7 year run of ZIRP. The inflation was already built in to the structure, as manifested in the US stock market. On that note, for this article we’ll look at said US stock market, the prime beneficiary of inflation through 2015. Again, see the first link above. The market is on the verge of negating the bear trend of lower highs and lower lows. While some indexes (like the mid caps) have already done so and the cumulative Advance/Decline line on the NYSE have been bullish, most indexes remain below their April highs. If they rise above that and close a week that way, the end of the bearish phase would be indicated. If this happens, where to invest in the US? If the US dollar weakens anew* (it remains in a bearish intermediate technical situation despite the current bounce) people should consider manufacturers and exporters. 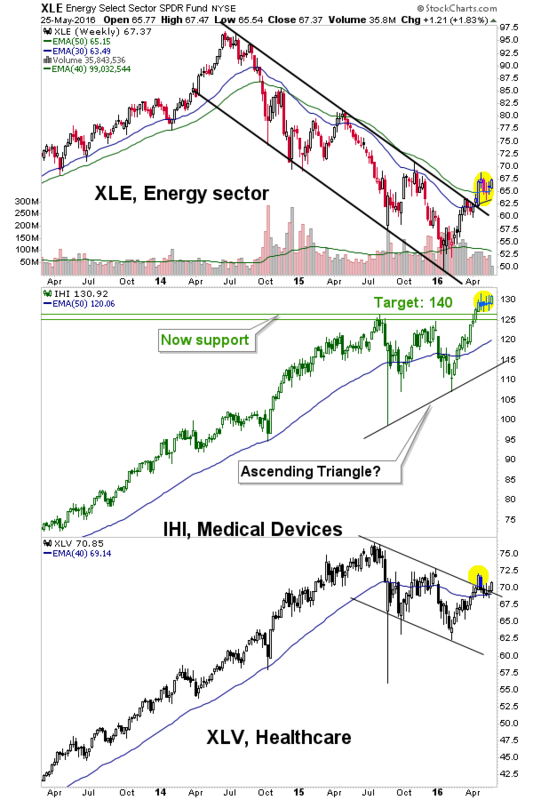 Also, as noted previously, progressive Semiconductor manufacturers, beaten down Healthcare situations and the Energy Sector, which we showed to have been in an unbroken secular bull market last year in anticipation of the coming bottom and updated in early January just before the bottom: NFTRH+: Energy Sector Future Buy Level (Reminder). Here is a chart we have updated each week in NFTRH showing some relatively constructive sectors amid the bearishness in general US markets. What the heck were Medical Devices doing so bullish during the onset of a bear cycle? Well, in my previous life in manufacturing I had always noted our primary customer base, medical device/equipment companies, were reliably strong throughout the business cycle. NFTRH+’s Boston Scientific (profit taken) and Medtronic (ongoing) are just two of many prospects in this area. It is important to remember that in the Greenspan inflation the economy did just fine. At that time we had the Dow-Gold ratio and charts like it to put the lie (it was inflation, not productive growth) to it. In 2016 we have had the beginnings of a similar situation, although gold is correcting vs. stocks (and most other assets) lately. * But with the Fed in a rate-hiking stance the dollar should gain strength, no? No, there is no need for that to happen. We are talking about inflationary inputs that went on for years upon years that were masked by a global deflation, resulting in a US Goldilocks atmosphere. Maybe that will be the case again, but if gold, silver and commodities have indeed bottomed as I believe they have, then we may yet see a Greenspan style phase. 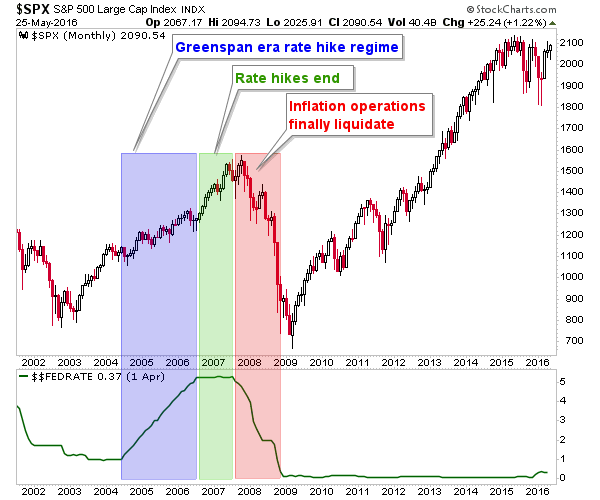 Notice how the best part of the 2003-2007 ‘inflation bull’ came after Greenie began a rate hike regime. We should wrap up because this post is getting long in the tooth. Assuming the week closes in similar status (constructive activity across many asset classes) we will look further (in NFTRH) into the prospects for various US stock market sectors, global considerations like emerging markets, and assets like commodities and precious metals. This article is simply a ‘look ahead’ because we do not yet have confirmations on a bullish turn in stocks and indeed, the goings on in the Semiconductor equipment sector have instigated the current line of thinking much more than something as choppy and erratic (lately) as the stock market has. As a ‘look ahead’ this is by no means a call to inflationary action. It is just part of a process of trying to understand which way the macro is likely to go in the coming months and possibly, years. Meanwhile, let’s leave the article with a look at the sensitive inflation indicator, silver vs. gold. It is a nice inter-market companion to the early economic signal in the Semi sector. 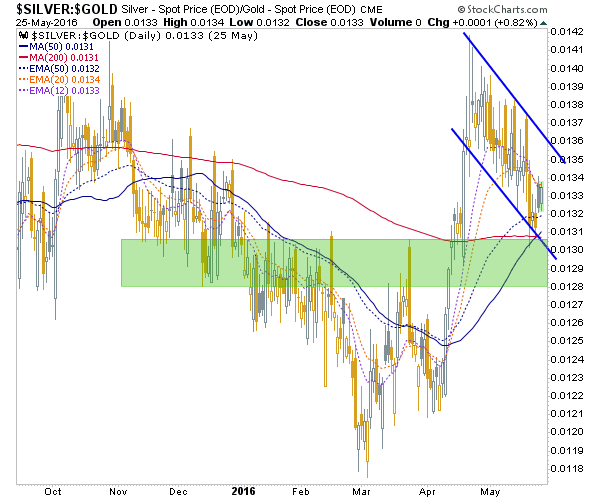 The daily chart of Silver-Gold has been flagging down to support. Has it found support yet or will silver correct further vs. gold? An open question, but what is near certain is that if an inflationary phase is to engage Silver-Gold will once again rise. So keep it in view.